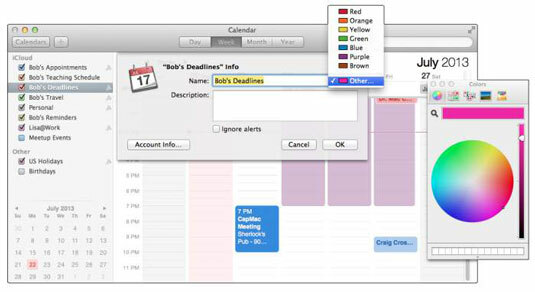 OS X Maverick’s Calendar is a wonderful program that provides multiple appointment calendars with alerts. More precisely, you can have multiple color-coded calendars, several types of visual, audible, and e-mailed alerts, repeating events, and more. 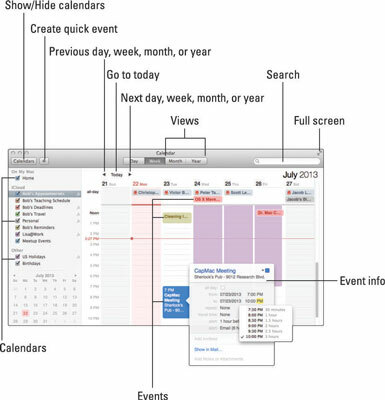 You can publish your calendar(s) on the web for others to view (which requires an iCloud account or other webDav server), and you can subscribe to calendars published by other Calendar users. You can view your calendar by the day, week, month, or year. To select a view, click the Day, Week, Month, or Year button at the top. To move back or forward, click the arrow buttons on either side of the Today button. You see the previous or next week in Week view, yesterday or tomorrow in day view, and so on. To go to today’s date, click the Go to Today button. You see a list of my calendars in the top-left corner: Bob’s Appointments, Bob’s Teaching Schedule, Bob’s Deadlines, Bob’s Travel, and so on. The check boxes turn the visibility of a calendar on (checked) and off (unchecked). The calendars appear in three sections — On my Mac, iCloud, and Subscriptions — because all three types of calendars are on my Mac. If you’re not an iCloud user, your calendars will appear in the On my Mac section instead of the iCloud section. Choose File→New Calendar→iCloud or On my Mac. Other is the handy choice because it lets you select thousands of colors — including the lovely shade of fuchsia— in addition to the seven colors available in the menu. Now any item you create while this calendar is selected (in the list that pops up from the Calendars button) appears on the selected calendar in the color you selected. While you’re in the Info sheet, you can also add a description of your calendar. Choose File→New Calendar Group, or press Command+Shift+N. A new calendar group named Group is created and added to the On my Mac section of the calendar list. Give the new group a name by selecting Group and typing a new name. To add calendars to the group, create a new calendar while the group is selected, or drag existing calendars below the group name in the list. 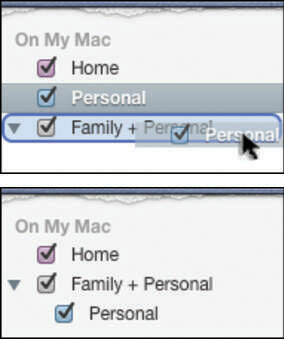 When you release the mouse button, the Personal calendar moves below the Family + Personal group. Note that the Personal calendar is indented and the Family + Personal group has a disclosure triangle to its left. Now you can show or hide all calendars in the group by selecting or deselecting a single check box. 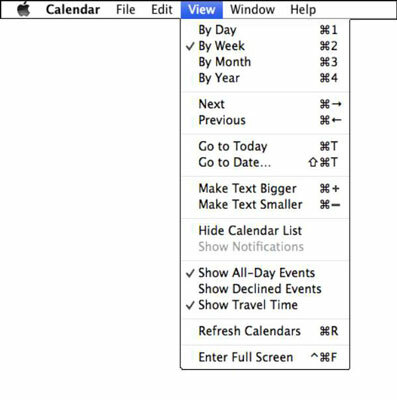 You can still show or hide individual calendars by selecting or deselecting their check boxes, of course. Here’s how you might deploy this feature. You could create individual calendars for each member of your family and put all the individual family calendars in a group called Family. Then you could make all the family-member calendars visible or invisible with a single click of the group calendar’s check box. To delete a calendar or calendar group, select it in the list and choose Edit→Delete or press Command+Delete. If the calendar has events on it or the group has calendars in it, you see an alert box asking if you’re sure you want to delete that calendar or group; if not, the calendar or group will be deleted as soon as you choose Edit→Delete or press Command+Delete. When you delete a calendar or group, all the events and reminder items in that calendar or group are also deleted. Although you can Undo a deleted calendar or group (choose Edit→Undo or press Command+Z), you must do so before you quit Calendar. If you quit Calendar without undoing a calendar or calendar-group deletion, everything on that calendar (or calendars) will be gone forever.